In the year 2017, Czech Chemical Society and Czech Society for Biochemistry and Molecular Biology in association with the general partner Sigma Aldrich spol. s.r.o., part of Merck KGaA and further sponzors in collaboration with CCS and SSBMB are traditionally holding the Interdisciplinary Meeting of Young Researchers and Students in the field of chemistry, biochemistry and molecular biology and biomaterials. 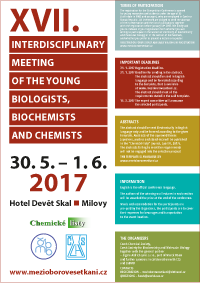 The registration form for the Interdisciplinary Meeting of Young Biologists, Biochemists and Chemists can be found here. Registration deadline is on January 31st, 2017, the same as deadline for sending in the abstract. The abstract should be sent in electronically in English language only and be formated according to the template, that is available on www.mezioborovesetkani.cz. The abstract should meet all the requirements stated in the said template. By March 15th, 2017, the Expert Committee will select participants and contact them by e-mail. The abstracts of the approved theses (speakers, posters and stand-ins) will be published in the "Chemické listy" journal, (part V, 2017). The abstracts failing to meet the requirements will not be engaged into the selection process! The template is available here. We strongly recommend you not to make any changes (in font, paragraphs etc.) while creating your own abstract. The registration for the Competition Conference is opened for young researchers and students under the age of 35 (birth date in 1982 and younger), who are employed in Czech or Slovak Republic. All interested are obliged to send the abstract of their presentation and the list of publications together with the registration before January 31st 2017. We kindly ask you to indicate in your registration form whether you are willing to participate in the section of chemistry or biochemistry and molecular biology or in the section of biomaterials, and whether you prefere to present a lecture or a poster. The authors of the winning oral lectures in each section will be awarded the prize at the end of the conference. Meals and accomodation for the participants are pre-paid by the Organizers, the participants are to cover their expenses for bevarages and tranportation to the event location. We kindly ask you to use the following e-mail address to contact us in case of any questions: fusek@uochb.cas.cz.